Readers often lament the price of graphics cards. One can argue the current positioning is to blame. Let's take Nvidia's latest RTX series as an example. The cheapest costs north of £300. Crank it up to the RTX 2080 leaves users finding at least £650. Yet that's nowhere near the maximum. You need to spend over a grand for the privilege of owning an RTX 2080 Ti, rising to a massive £1,500 for liquid-cooled models offering the best gaming experience around. The GeForce RTX 2080 Ti iChiLL Black is a largely unassuming card primarily covered with a perforated plastic shroud and matching backplate. The design is completely enclosed and the card fits into a two-slot form factor that we like. The board itself won't clutter up your chassis because it measures just 272mm (l) and 112mm (h). Being a totally integrated solution means there are no external wires to hook up, unlike the previous generation. 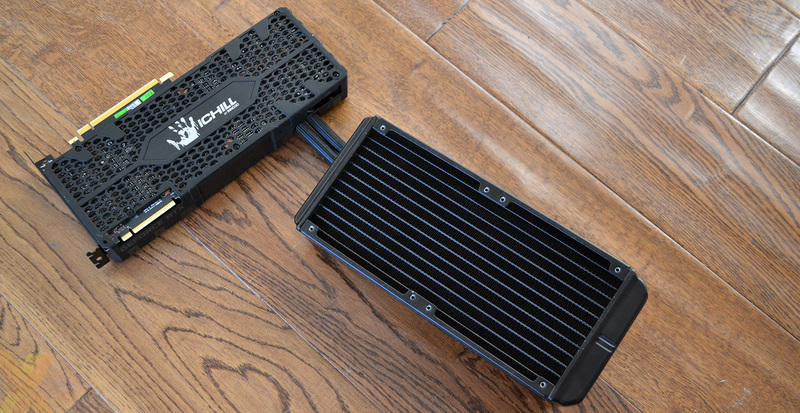 The package's entire power is sourced via the usual combination of PCIe slot and dual 8-pin connectors, and there's a decent amount on tap. Inno3D raises the TDP from 250W to 300W and enables an extra 35W for the USB Type-C on the rear. We'd normally worry that jacking up the juice would cause thermal or noise problems - the gigantic MSI Lightning being a good example - but as you will see later on, this is not the case here. 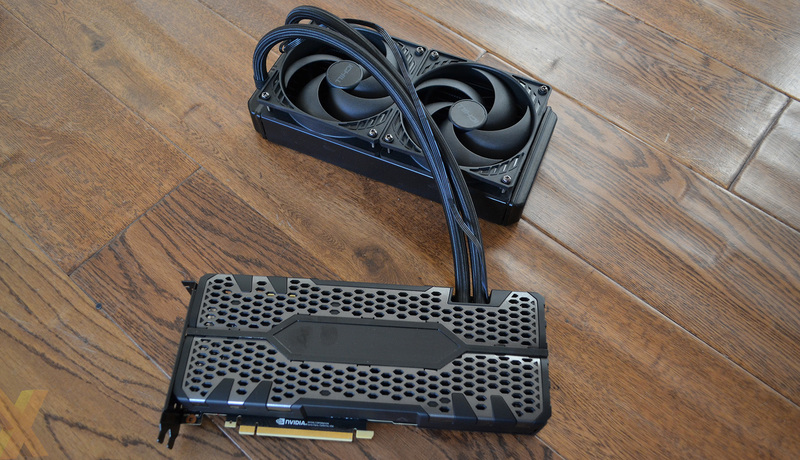 Underneath the shroud resides a self-contained cooling system that's completely redesigned from the 10-series cards. Gone is the hybrid approach, where a large fan resides on the card, replaced here by a waterblock and full-coverage plate that cools the VRMs and memory modules, too. It is interesting to note that Inno3D uses what appears to be the Founders Edition PCB, rather than a custom model, and such a move makes sense when trying to get a card out to market relatively quickly. This isn't some in-house-developed cooler, mind, as Inno3D makes no bones about teaming up with specialists Arctic for the iChiLL Black Edition cards. Most of the cooling know-how appears to come from the Liquid Freezer 240mm CPU model. 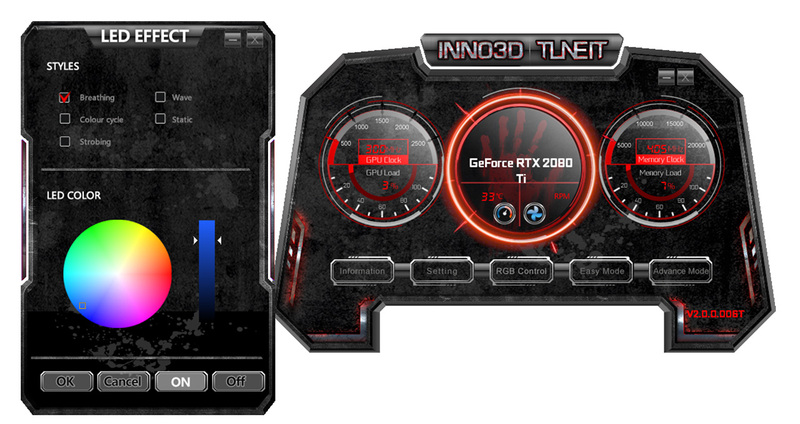 In moves to appeal to the gamer, the side of the card features the usual RGB lighting controllable by motherboard apps - Inno3D's own TuneIT utility works for this feature but isn't as polished as, say, Asus' Aura. Rather more strangely, the central black section is actually a colour TFT screen that cycles through and displays information such as GPU speed, memory speed, temperature, and fan speed, along with juvenile messages such as 'hear the footsteps' or 'absolute silent'. Being where it is, the screen is only useful for chassis that offer vertical card placement. Snaking away from the unit is 400mm of sleeved tubing which hooks up to a 240mm radiator that's almost 40mm thick on its own. The nature of the design is such that it's closer to 280mm all told. Strapped up top are a couple of 120mm spinners that, thankfully, do switch off at low loads. Inno3D reckons such cooling prowess is able to shave off more than 20°C compared to the air cooling present on the Founders Edition which, remember, uses the same PCB. Tubing is reasonably flexible and long enough that you can install the radiator in multiple positions inside a large-ish chassis. Our be quiet! Dark Base 700, already using a Fractal liquid cooler for the CPU, worked best with the radiator located by the front intakes. With all this cooling in mind, as well as increased power, you'd think the Black Edition would push the boat out with respect to frequencies. Like most, memory is kept at a standard 14Gbps, which is a shame. The core does see an uplift, to a certified peak boost of 1,695MHz, though do understand this is somewhat slower than the 1,770MHz for the MSI Lightning. In fact, a number of premium air-cooled cards offer guaranteed speeds of between 1,770MHz and 1,815MHz, so what gives? The truth is that Inno3D plays the frequency game very conservatively. Our detailed logs show the sample card rarely runs slower than 1,930MHz (and consistently so) under the pump, if you excuse the pun, so Inno3D could have specced it a fair bit higher. This helps explain why the company has, until very recently, been playing around with BIOSes that offer varying frequencies and power limits. We can't foresee any problem in this card running 1,830MHz out of the box. The cheapest GeForce RTX 2080 Ti is about £1,049. Pre-overclocked models outfitted with exuberant air cooling fetch between £1,250 and £1,500. This watercooled effort fetches that £1,500, as well. Sure, that's really, really expensive... but is the going rate for an AIO-cooled model: Aorus' Xtreme WaterForce is the same price. For what it's worth, the package also includes an iChiLL mouse mat, VRMark, 3DMark and a driver CD. Offering piece-of-cake installation and plenty of potential, let's fire up the benchmark rig and see if this is the fastest graphics card we have ever tested.